A couple of days ago I attended a small gathering, attended by other farmers, Penn State Extension and representatives from the Packard Foundation. The purpose of the get together was to talk about the upcoming Farm Bill, the proposed cuts to the budget, and the conservation portion specifically. The Packard Foundation has conservation as their primary focus, and has created a number of these forums across the country. The Farm Bill is split into 3 parts, and 3 different government agencies are funded via the farm bill. 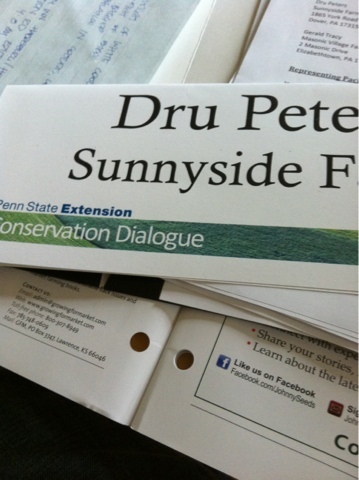 NRCS has funded, in Pennsylvania, a number of changes in farm business practices, usually to reduce impact of animal waste in waterways, to create buffer zones on fields, to educate on no till farming..in general, to lessen impacts that farms were having on their own and on neighboring land, streams and air. Another portion of the Farm Bill funding has gone to commodity funding...paying farmers to grow some specific crops: corn, soy, cotton, rice. The third agency funded by the Farm Bill is food help...the SNAP (formerly food stamps) the free/reduced meal plan in public schools, WIC. After this it gets a bit hazy for me. There are people who know better than I what else is funded from this massive, many billion dollar bill. The USDA has funded construction of hoop houses, food hubs, commercial kitchens and more. I think that must also come from the farm bill but I am not certain. Proposed cuts are massive. Billions and billions of dollars are proposed to be cut from this bill. The direct payment for commodity growing is currently proposed to be eliminated. There sounded to me like rumblings of discontent over that cut, and implied that without funding of the growth of corn, soy, etc. the farmers would need to return to stream to stream, road to road planting...that continuing to use conservation practices that grow out animal feed would be abandoned as soon as payments ended. Originally (last year) it looked like the food subsidy portion would not be cut. That has changed, and it looks likely that cuts will occur in subsidized food programs. For the farmer, the business safety net that exists ensures that if they plant the GMO corn and soy they will still be paid. Not in direct payment but with a crop insurance program. I'm not certain who pays the premium (if any) on this insurance. As farmers, we write an annual business plan based on a certain percentage of losses, based on a best guess estimate of cost increases on farm inputs, costs of utilities, insurances, taxes and the like. What I continue to learn is that nonprofit farms own a lot of land. Exempt from real estate tax because of their nonprofit status, they have a massive impact on their state and local governments by not paying these taxes. The plain sect (Amish and Mennonite) are exempt from Social Security taxes, as well as exempt from the draft for military service. And the big farms are subsidized in a number of ways by the federal government. 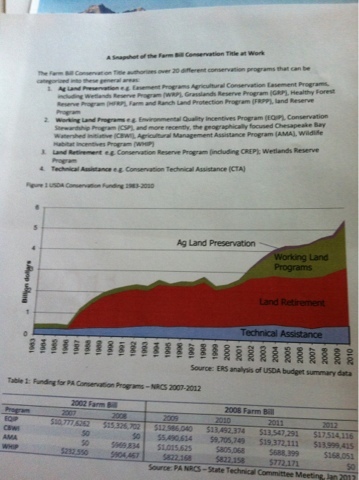 It is public record the amounts of money given by the various agencies to farmers: and it is very clear that the farms that are funded are the very large ones, the very CAFO's and feed lot farms that are funded on the one hand to grow the GMO crops are also accepting payments to reduce the impact of these farm practices on the environment. We opted for Food Alliance Certification to easily and clearly let people know that we are GMO free, that our animal waste is handled in a way that rebuilds our soil, that we have buffers around our land, that we work to keep our water here and not have it run off, or be filled with all sorts of toxic chemicals when it rains. We do all of this with no government subsidies. We run our farm like every other business we have run: write up a budget, stick as close to it as possible, allow for a high percentage of losses, bank any extra money for bad years, grow and preserve as much food as possible while in season for the rest of the year. I must admit that after my father died ( I was 14 at the time) my family did receive, as I so often hear "government handouts". We shopped for food with food stamps, I qualified for reduced lunch, went to a public clinic for medical and dental care and received Social Security, Civil Service and Veterans benefits while in school and until I finished college. I worked all through college as well and have worked since. Without that help while in school my life would be very different right now and would have been my entire adult life. I have always believed in our democratic system, a system that extends help to people in need, a system that helps mentor and grow children into contributing members of society. My personal experiences tell me that I would have been lost without the assistance, and that my father paid for years into the system and I have too. While I don't believe I should be taxed to death I also know that people I hear objecting to the tax rate are also usually benefitting from our government payouts themselves. Sometimes it is because their aging parents are in a care facility and the funding for that care comes from Medicare/Medicaid. Some have children with special needs that either receive direct payment to support them, subsidized work payments, the ability to live in a group home (away from the family of origin) or have special teaching accommodations made for them. I have no objections to this. I believe our society is better taking care of our aged members without bankrupting a family. That the infirm need support. That children need meals. I'm just having a difficult time lately with hearing about farmers running farms in a way that ensures government payouts. And objecting to free lunch like what is fed to these kids is caviar and not glop. Having difficulty hearing nonprofit farms say they don't compete for business when they take what they grow and sell it at farmers markets, direct to institutions and restaurants and yet don't pay their local school tax. That somehow they should get concessions or outright checks from the government and others should not. It looks and feels to me, (having only ever worked in for profit businesses that required me to increase business if I were going to get a bonus and keep my job) that the welfare mentality is alive and strong, that plenty of farmers have set up their businesses and tax statuses to either exempt themselves from paying in, or cashing checks on the other side. And it just does not feel right to me. Objections to other business bailouts by the federal government have been loud and strong, but the propping up of the low price of food, the propping up of massive farms with practices that directly pollute our earth system, and now are known contributors of health issues...why is our government supporting this type of farming? Why is the cost of food production subsidized daily by our government? In some areas land is outrageously expensive and those people pay more for food, as they should. But why are we all paying billions to keep GMO corn and soy growing? That is refined into high fructose corn syrup and partially hydrogenated vegetable oil, 2 things well documented to cause a myriad of health issues? The very ones that cause people to require medical care from Medicaid and Medicare? I'm just a farmer's wife in a small town in south central Pennsylvania. But I am scratching my head every day over these questions and wondering how we all got here. And now it is time to go pick peas and strawberries, and put strawberries by so we can eat them this next year, without having to import from another part of the world. Blueberries next week. Plums and cherries too. We are ready.